General purpose AWG for frequencies less than 10 MHz. 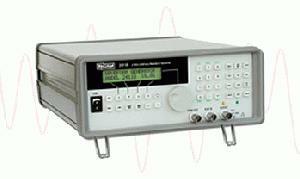 TEGAM most popular arbitrary waveform generator models, the 2414A/2414B are high sample rate AWGs designed for applications where outstanding waveform memory is required. With up to 1,000 stored waveforms and 12-bit resolution, these models feature 160k points of active waveform memory. Waveform editing can be performed through the front panel of the 2414A/2414B or with optional WaveWorks Pro+ software. RS-232C interface comes standard with each unit. GPIB interface is available, along with a wide variety of other options and accessories.